Human Trypsin 1, encoded by the PRSS1 gene, is also known as cationic trypsinogen. It contains a signal peptide (residues 1‑15), a pro region (residues 16‑23), and a mature chain (residues 24‑247). Trypsin is part of the serine protease family. Trypsin cleaves lysine and arginine at the C-terminal side of the peptide. Trypsin optimum pH is pH-7 to 9. The enzyme is inhibited by serine protease inhibitors, e.g. PMSF, and by metal chelating agents, e.g. EDTA. Recombinant Human Trypsin-1 is a genetically engineered protein expressed in E. coli and purified by standard chromatography techniques. 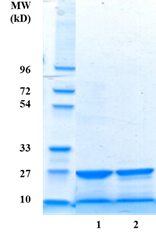 Recombinant Human Trypsin-1 is free from any animal and human sources. There are no contaminating enzyme activities such as carboxypeptidase A and chymotrypsin. No protease inhibitors such as PMSF are contained in the preparation. Source: Human trypsin-1, expressed in E. coli, with a C-terminal 6-His tag. Unit Definition: One USP unit of trypsin activity will produce a Delta A253 of 0.003 per minute in a reaction volume of 3.0ml at pH7.6 and 25℃, with BAEE as a substrate (1cm light path). Storage: Store at -20°C. Avoid multiple freeze-thaw cycles.